Migrants are seen in a rubber dinghy as they are rescued by the Libyan coast guard in the Mediterranean Sea off the coast of Libya, Jan. 15, 2018. 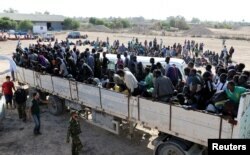 Somali government efforts to evacuate a large number of Somali migrants from Libya hit a snag after the delegation sent there was unable to persuade migrants to abandon the dangerous sea journey to Europe and instead return to Somalia. Members of the delegation say the migrants have told them they have suffered during the journey to Libya and feel that they have “nothing else to lose.” Officials say the migrants are determined to make a final attempt to reach European shores. The delegation arrived in Tripoli Monday, and its members say they have visited detention camps and received some migrants at the Somalia embassy, but so far only 11 people have expressed an interest in returning to Somalia. The number of Somalis who have migrated to Libya is estimated to be between 5,000-6,000, officials say. Migrants ride in a truck to a detention center in the coastal city of Sabratha, Libya, Oct. 7, 2017. While the vast majority of the Somali migrants in Libya are being held in areas controlled by militias that were too dangerous for the delegation to visit, nonetheless they say the majority of the people they have met made it clear that they don’t fear taking more risks to reach Europe. Mariam Yassin is the Special Envoy for Migrants and Children’s Rights of Somalia and was among the delegation. She says lack of access to many of the Somali migrants is a factor, as they are held in areas not controlled by the Libyan government. But the main the reason given by people for not returning, she says, is that migrants are desperate to reach Europe. “I met this woman who said, I was here in Libya for less than two years, I spent $18,000, I’m not going back to my mum with nothing, I’m not going back,’” Yassin explained. She says the proximity between Libya and Europe gives people false hope. From Tripoli the lights of Lampedusa, Italy, are visible, and that gives migrants hope that they can reach Europe. “They say they have suffered enough and want to take the last chance,” Yassin told VOA Somali. Yassin said when migrants are told that there are alternatives to the risk, and that they could have the same life in their own country, there is a doubt in their eyes that the risk they are taking is not worth it, but they are determined to reach their target. “We can’t force them, but we’ll give them awareness and encouragement to return,” Yassin says. When the Somali delegation arrived in Tripoli on Monday, they met several Somalis who lived in terrible conditions, having just been released by the smugglers. Ahmed Abdikarim Nur, commissioner of refugees and internally displaced persons of the Somali government said 99 percent of the people who are traveling are young people, and the youngsters are particularly reluctant to go back. “They feel they spent all their parent’s wealth, and possibly they did not tell their parents when they started traveling to Libya, so they feel they have nowhere to return to, they are traumatized,” he said. FILE - U.N. Migration Agency staff assist Somali and Ethiopian migrants who were forced into the sea by smugglers. Yassin was particularly documenting the situation of unaccompanied children who are willing to return. She said she only persuaded two of them, one 16 years old and the other 17. They have been in Libya for a year and half. She said both were traumatized and would not give a lot of information about their ordeal. “I tried to speak to the 16 year old but he said, ‘Let us talk on the way to Somalia,’” she said. The other teenager showed a bit more composure and told the Somali officials that they were tortured while in the hands of smugglers and traffickers. She said the case of the unaccompanied children is particularly worrying. She said some of the children lie about their ages so that the International Organization of Migration and UNHCR won’t identify them and contact their families to get permission to put them under their special protection. If they are identified as minors and the organizations contact their families they will have no chance of boarding those boats, they don’t want that to happen so they lie about their age,” Yassin said. Migrants who were injured in a truck crash are seen at a hospital in Bani Walid town, Libya, Feb. 14, 2018. While the Somali delegation members were in Libya, a migrant truck flipped over near Bani Walid town Wednesday killing more than 20 migrants mainly from Somalia and Eritrea. One of the Somali migrants who had been held in Bani Walid said he knew many of the migrants traveling in the truck. He said he knew at least seven Somalis who died in the incident. He said 260 migrants were on board the truck when it flipped over. He said he was told the death toll is higher than reported by media. As the delegation appealed to the Somali migrants to take the chance to go home, the beaten man they met at the Embassy was still uncommitted about returning. 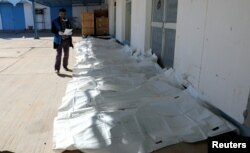 Bags containing dead bodies of migrants who were killed in a truck crash, are seen at a hospital in Bani Walid town, Libya, Feb. 14, 2018.